The Hawaiian Islands are home to a range of unique, endangered bird species. Many waterbirds such as the Hawaiian Coot and Hawaiian Gallinule have been recovering in recent decades thanks to intensive wetland management, but past declines have left them with reduced genetic diversity. A new study from The Condor: Ornithological Applications looks at what the birds' genes can tell us about their behavior today and finds that one species' lack of wanderlust may be putting it at greater risk. The U.S. Fish and Wildlife's Jared Underwood and his colleagues trapped birds on Oahu and Kauai and took blood, tissue, and feather samples. Genetic analysis conducted at the U.S. Geological Survey by Sarah Sonsthagen and colleagues showed that Hawaiian Coots disperse regularly between islands, while Hawaiian Gallinules do not. The researchers believe that Hawaiian coot populations in some wetlands are reaching the maximum they can support, which is one factor causing them to leave in search of new territories. Historical evidence suggests that gallinules also moved around frequently prior to population declines, so either their behavior has changed, or, unlike the coots, they have yet to reach local carrying capacities. 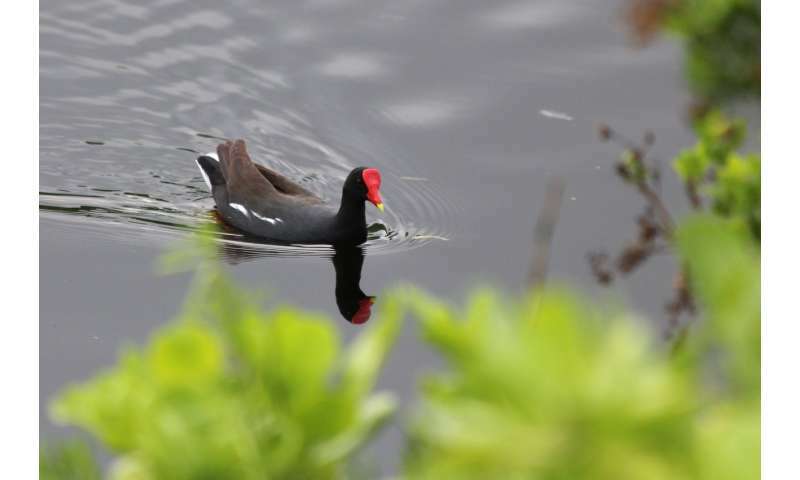 "The Common Gallinule as a species is considered quite vagile—that is, it tends to move around a lot—so it was surprising to find a high level of genetic structure between two islands separated by only 175 kilometers," says coauthor Jared Underwood. "Other Common Gallinule subspecies found in the Pacific frequently move between islands that are separated by greater distances." Hawaiian Gallinules' homebody tendencies put them at greater risk from severe one-off events like hurricanes, which could wipe out an entire island's worth of birds. Their lack of gene flow also means that populations on individual islands need to be larger in order to be viable long-term. Despite recent population gains, the researchers warn that rising seas, diseases, and introduced predators continue to threaten both species. "A key component of the resilience and persistence of species and populations is the retention of genetic diversity," adds Underwood. "Information regarding the genetic structure for each species will allow managers to design different strategies and criteria for the species' recovery."